Our best pals can’t help but leave a little part of them with us, in the form of their fur, wherever we go. It’s inevitable, especially at certain times of the year. You get dressed for work or a party and find your favorite black slacks or dress have grown a coat. I even find that my pets come on holidays with me, they hide their fur in my suitcase. Rather than take out an investment in a company producing lint rollers, find out why dogs shed their fur and how a dog shedding shampoo can help to stop it. Here is our guide to the best dog shampoo for shedding. Dogs usually shed with the seasons, specifically in spring and fall. Longer days associated with spring stimulate their hair to grow and, therefore, more is shed. Similarly, as the days get shorter in the fall, not only will you find more leaves on the ground, but more fur on your floor. Indoor dogs will shed consistently throughout the year. This is due to being kept in a controlled environment with less temperature and light changes. However, their shedding will tend to be lighter and less than their outdoor counterparts. Dogs’ hormones are also affected by changes in daylight, especially when they spend a lot of time outdoors. The amount of hair a dog sheds can vary from breed to breed. Dogs such as collies, Siberian huskies or Australian shepherds, have double-layered coats. This is a soft undercoat which insulates, and a coarse top coat which repels water and helps keep off dirt. These dogs generally shed twice annually, sometimes losing the fur in tufts. Single-coated dogs, with little or no undercoat, such as poodles, dachshunds, Afghan hounds, and some terriers, don’t shed as much. Irrespective of the breed of your dog, there are times when the tumbleweeds of fur will blow around your home. 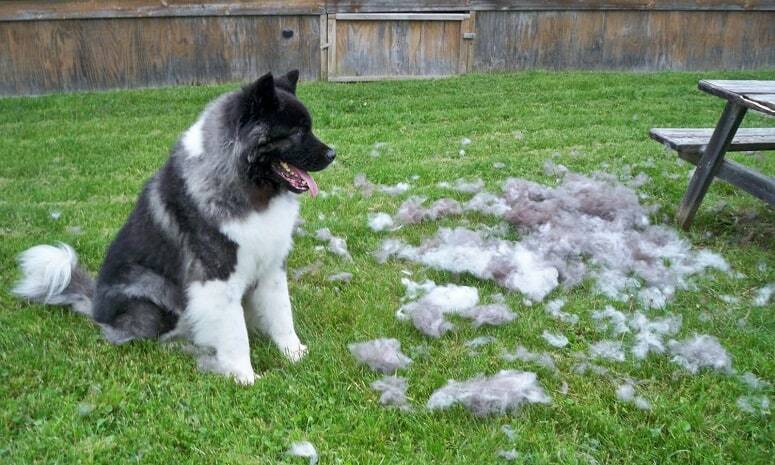 In most cases, it is normal for a dog to shed excess fur. However, it’s a good idea to get used to their shedding patterns. If your dog begins losing fur at a time of year when you don’t expect it, there may be an underlying problem. Certain health conditions, like endocrine disorders or follicular dysplasia, a genetic disease, can cause shedding. Other factors which come into play are allergies or skin conditions. If your dog has skin irritation, bald spots or open sores, seek veterinary help. Other indications which can contribute to shedding are excessive scratching or constant licking. A thin, dry or dull coat can also shed more. How Can I Help Prevent My Dog Shedding? A good daily brushing can help reduce the amount of fur you will experience around your home or on your clothes. Some brushes are designed to remove the undercoat, such as the DakPets de-shedding brush. It makes sense that the more fur you can remove by grooming your dog, the less will end up inhabiting your home—and clothes. 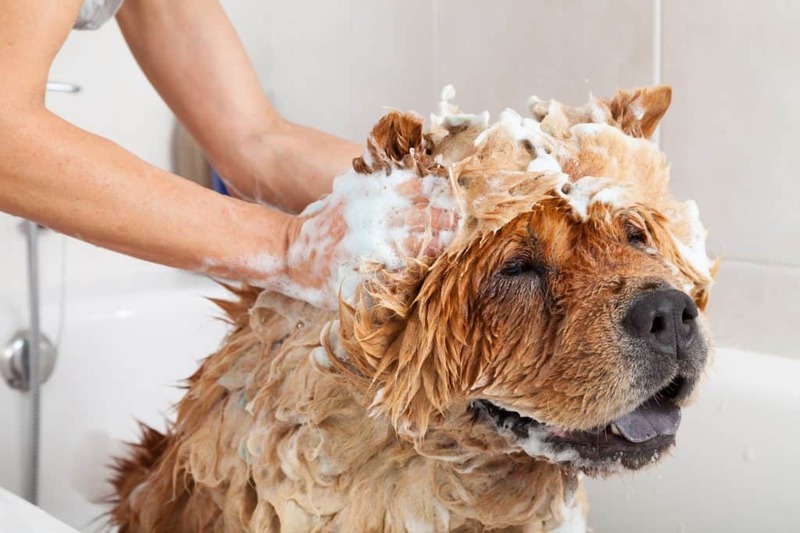 Bathing a dog in a shampoo designed to reduce shedding can also help. The frequency of the bath will depend entirely upon the breed, type of coat, the dog’s health and the amount of activity they do. After all, rolling around in a muddy field will mean more baths than lying asleep on the couch. It also depends on how much dogginess you can deal with. An unwashed dog will develop an odor all of its own. Some dogs can be bathed as often as once a week, while others should only be given a bath every few months. What Should I Look For In A Shampoo For Shedding? Omega 3 and Omega 6: These are both fatty acids which have an important role in the health of your dog’s hair and skin. They can help in the treatment of skin allergies such as eczema and other types of dermatitis. Dog foods containing these fatty acids are also beneficial for overall skin health. Vitamin E: This vitamin is prevalent in skincare products for humans, especially beauty products, like face creams. So if it’s good enough for us, is it good enough for man’s best friend? Definitely. Vitamin E can benefit dogs, both in their diet and when applied to their skin. Aloe vera: This natural moisturizer has been around for centuries. It can even promote the healing of wounds in dogs. Oatmeal: This anti-inflammatory, antioxidant ingredient in a shampoo can help moisturize your dog’s skin, keeping it healthy. Vitamin B5: It helps promote healthy skin when ingested, and is used topically for some skin conditions. Coconut: Coconut oil is a multifunctional skin treatment. It has antimicrobial properties and helps moisturize and soothe skin. It also helps reduce doggy odor. Of the many products available on the market, these are the ones we feel are best for the fight against furballs around your home. Oster supplies a number of grooming products for animals, including dogs. The oatmeal essentials shampoo is made in the USA and is pH-balanced to be gentle on your dog’s skin. It contains no alcohol, dyes, parabens or phthalates. All the ingredients are biodegradable. It helps to gently reduce shedding, keeping the fur on your dog and not all over your home. User Reviews: Customers find this shampoo leaves their dog’s coat soft and shiny. Some find it can reduce shedding by up to 95 percent. This shampoo creates a great lather, which rinses easily, leaving no residue. It also seems that a little goes a long way. When it comes to the smell, there are mixed reviews. Akin to baby powder, it appears customers either love it or hate it. Bottom Line: The 18-ounce bottle is good value for money, compared with similar products. The natural ingredients help moisturize and soothe your pooch’s skin while keeping hair where it belongs—on the dog. The Furminator brand has become synonymous with products to help with shedding. It produces many grooming brushes and other products, including this shampoo. Used in conjunction with some of the brand’s other tools, it is an effective antidote to excess shedding. However, while perfectly safe, this is not an all-natural product. It does include mild surfactants, a chemical which helps soap bind with water for cleansing. This could be effective in releasing the stubborn undercoat on your dog. The manufacturer recommends using this with their de-shedding conditioner for best results. User Reviews: Some people find they seem to have equivalent fur for another whole dog in the bath after using this product. It seems brushing and shampooing using Furminator removes a lot of shedding hair. However, for some, while they find it’s a great shampoo with a nice smell, it does not decrease shedding in the long term. Bottom Line: This dog shedding shampoo contains mainly natural products, but, there are some chemicals in it. While these are not harmful to dogs, the product could be a bit harsh if your pet has sensitive skin or any skin conditions. It appears the regime of bathing with this shampoo and conditioner, then brushing, works the best. This all-natural shampoo has four benefits: it cleans, conditions, deodorizes and neutralizes odor. Its soap-free formula is safe to use with topical flea and tick treatments and it helps a dog maintain normal shedding reducing excess. It can also prevent static electricity building up on your pet’s coat. It also contains un-named rinsing and conditioning agents and an odor-control system. User Reviews: Many find that this shampoo works to reduce the amount their fur babies shed. It lathers well and rinses easily, and the natural botanical smell is pleasant. However, some find it does not last beyond a few days, and the dogginess returns. It may also be a good idea to get a pump for the bottle as it appears to be difficult to hold. Especially when managing a wet dog. Bottom Line: This all-natural shampoo is a hit with many customers. Dogs’ coats are left soft and shiny, and they shed less of it. There are no parabens or dyes, making it a good, safe option for bathing your pets. The large bottle size means it will last a long time and is good value. Wahl produces a range of shampoos and doggie deodorants. Using natural products, this anti-shed shampoo aims to clean your dog’s coat and leave it refreshed. Promoting a healthy skin and coat can result in the reduction of dander and fur deposited around your home. The shampoo is free of “PEG-80,” a surfactant known to cause allergies. It also contains up to five percent more natural surfactants than similar brands. User Reviews: The de-shedding properties of this shampoo are found to be good by many customers. No more furballs flying around the floor or being deposited on clothes, furniture, and dog beds. It produces a good lather and is very easy to rinse off your dog. The fresh smell appeals to some, while others like the soft, silky feel of their pet’s coat. Bottom Line: This dog shedding shampoo is designed to be gentle on a dog’s skin. The ingredients are chemical free, plant-based and all-natural. Although a comprehensive list is not provided, it does contain oatmeal and aloe vera. Both of these can help moisturize and protect a dog’s skin and coat. It appears to help out when it comes to the shedding issues that accompany our furry friends. If you are looking for value for money in a de-shedding shampoo, this could be the one for you. This 1-gallon container has an ultra-high concentration of 50:1 and is all natural. It is manufactured by Kim Laube and Co., a company that provides a number of grooming products to professional groomers and veterinarians. It also contains other herbs and extracts, and natural oils. It is pH-balanced and biodegradable. User Reviews: Customers find that this shampoo is effective in preventing their dogs shedding too much. Some even use it on their own hair. The container is rather large and some find diluting can be a bit tiresome. Others love the fact that it will last them for a long time. Bottom Line: The product is designed to combat dead skin, odors, and excessive oils It also cleans, conditions and moisturizes making it a good all-rounder. The size and concentration make it a good budget choice. It can be used with flea control products and on a number of animals, including dogs, cats, horses, and rabbits. 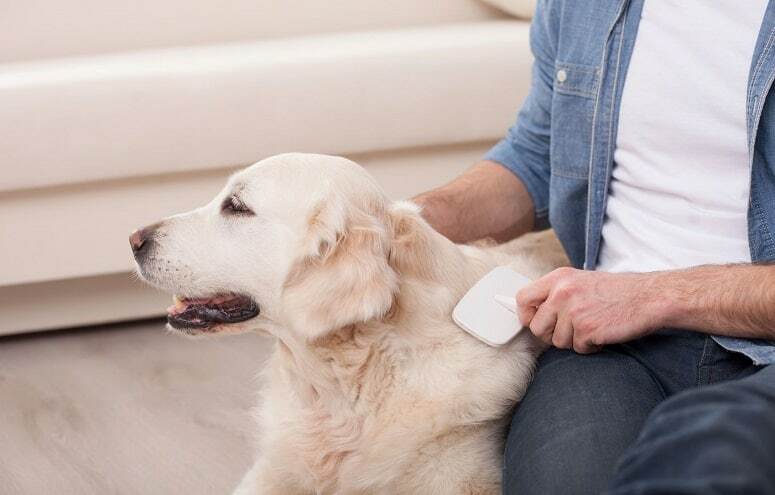 It makes grooming easier and reduces shedding. Reviews from customers of shampoos to reduce shedding are mixed. However, what we did find, is when combined with regular grooming, they seem to work quite well. Worst case scenario, they will help your dog’s skin health and make them smell good. While all the shampoos we have featured can help reduce shedding and are safe for your pet, our top choice is Oster Oatmeal Essentials. This reasonably-priced shampoo is made in the USA and is all-natural, containing no alcohol, phthalates, parabens or dyes. Moisturizing, soothing oatmeal and cleansers will leave your dog’s coat soft and shiny. The 18-ounce bottle is sufficient for quite a lot of bathing, and the cost won’t break the bank. Customers extol its de-shedding capabilities and comment that a little goes a long way. Whichever shampoo you choose for your canine companion, you will reap the benefits of less hair in your home.